Rustic with its oak veneer with an natural oak finish, Lakehurst embodies everything a fishing or hunting lodge should be. Metal rivets give it an extra rugged look. But it has its secrets – lift table and you’ve got a little storage hideaway. Materials: Oak veneer, Hardwood solids, Antique Pewter Hardware and Metal, Casters. 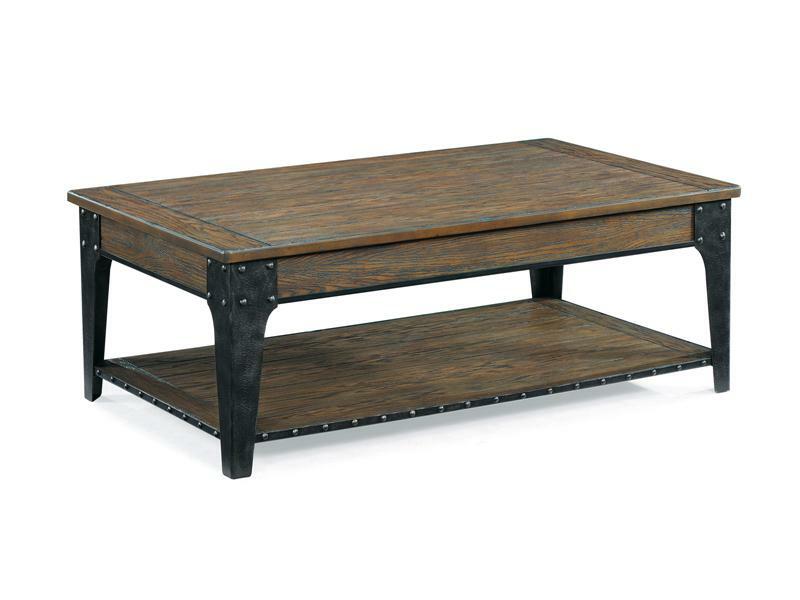 End table features 1 drawer and bottom shelf with metal edge. Accent table features bottom shelf. Cocktail tables features center lift-top and bottom shelf with metal edge. Sofa table features drop-down dresser at center and 2 small drawers at 2 sides and top desk.